Do your students have a difficult time finding reliable online sources? Mine could never decide if a website was considered suitable for research or not, so I came up with this rubric. 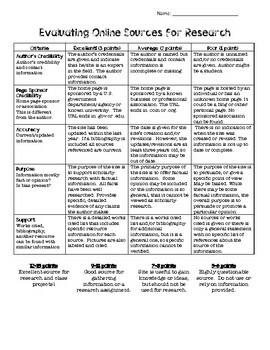 The rubric evaluates a source on 5 criteria: Author's Credibility, Page Sponsor Credibility, Accuracy, Purpose, and Support. To teach the rubric to my students, I modeled evaluating 3 different sources (Excellent, Good, and Useful) to help them see how to judge each source. If you have a subscription to BrainPop, there's also an excellent video that helps explains many of these criteria.